Phytoplankton are microscopic organisms that live in fresh and salt water. Blooms occur when plankton encounter a vein of nutrients and go on a feeding (and multiplication) frenzy. 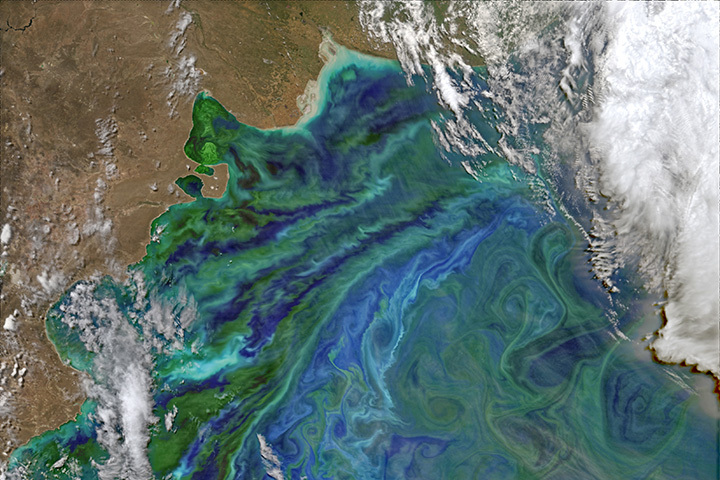 Like plants, phytoplankton use photsynthesis to convert sunlight into energy. They use the same green chlorophyll pigment, that’s why the oceans turn aquamarine during the plankton blooms, as you can see in the picture below. The plankton ecosystem are highly threatened by ocean acidification, a direct result of climate-change. The higher levels of carbon dioxide in the atmosphere make the oceans to dissolve more carbon dioxide and thus more acidic.